The HMG-CoA reductase pathway is also called the mevalonate pathway or the mevalonate-dependent (MAD) route. The HMG-CoA reductase pathway is an important cellular metabolic pathway present in almost all organisms. The pathway generates hydrophobic molecules for diverse tasks such as maintenance of cell membranes, production of hormones, anchoring of proteins, and for N-glycosylation. 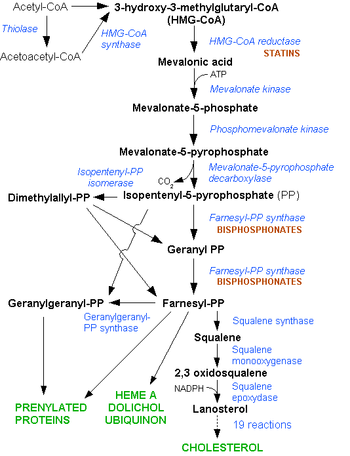 Plants can generate isoprenoids by way of the HMG-CoA reductase pathway and the methylerythritol phosphate or MEP pathway, which is also called the MVA independent pathway, in plastids. 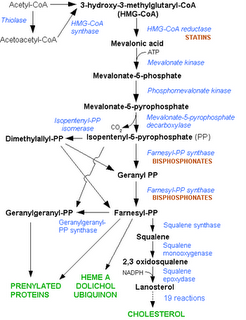 Isoprenoid biosynthesis pathways in the plant cell. HMG-CoA, Hydroxymethylglutaryl CoA - small image + legend, 242 k image. Several key enzymes of the pathway can be activated through DNA transcriptional regulation on the activation of SREBP (Sterol Regulatory Element-Binding Protein-1 and -2). This intracellular sensor detects low levels of cholesterol and stimulates endogenous production by the HMG-CoA reductase pathway, in addition to increasing lipoprotein uptake by up-regulating the LDL receptor. Regulation of this pathway is also achieved by controlling the rate of translation of the mRNA, degradation of reductase and phosphorylation. Because cholesterol is a product of the HMG-CoA reductase pathway, several drugs target the pathway. These include Statins, which are used to treat elevated cholesterol levels, and Bisphosphonates, which are used to treat osteoporosis.